Two Chicks On Books: Blog Tour- ROSEBLOOD by A.G. Howard Book Playlist and TWO Giveaways! 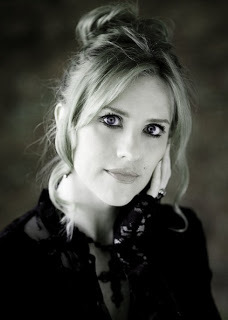 Blog Tour- ROSEBLOOD by A.G. Howard Book Playlist and TWO Giveaways! Hey y'all I am so happy to be hosting a spot on the ROSEBLOOD tour! I adore A.G. Howard and this book was absolutely fantastic! I have the book playlist to share with you today so check that out and make sure to enter the TWO amazing giveaways at the the end! Haven't heard of ROSEBLOOD? Check it out! Make sure to pre-order the book from Abrams! Welcome to stop #2 on the RoseBlood tour! This is an encore presentation spotlighting five special songs from my official RoseBlood playlist. At the bottom of this post, I'll reveal a link where you can find the full playlist. And don't forget to enter the rafflecopters; one is for a chance to win a RoseBlood hardback / mask set, and another is for today's INTL prize pack! For any readers familiar with my books and my website, you'll know that I like to make and listen to playlists for every book I write, and I always share those songs with readers. Here’s my Splintered Series playlists, as an example. Today, I'm spotlighting 5 songs that played a special role in the writing of RoseBlood. This song is a perfect reflection of Thorn through Rune's eyes: the enigmatic, broken, masked boy who appears and vanishes as if by magic, who seems to know all of Rune's secrets and how to heal her soul sickness with his violin, who's trying to find his own truths, while trapped between loneliness and loyalty, and humanity and love. Just as Christine sings in the Broadway musical: "And do I dream again, for now I find, The Phantom of the Opera is there inside my mind," Rune's own dreams become more substantial than reality at times. This song embodies the eeriness and mystery behind those interludes. Thorn and the Phantom have a strained relationship throughout the story, a rift caused by Rune's presence at the academy. But this isn't a romantic love triangle. If anything, it's a triangle formed by a boy torn between his love for his father, and his blossoming feelings for a girl he has an otherworldly connection to. I could almost envision the father and son performing this duet as Thorn plays his violin (in place of a cello) -- the Phantom lost to bitterness from past experiences, and Thorn craving the freedom to have those very experiences for himself. Where would a Phantom of the Opera retelling be without some operatic inspiration? This particular heartbreaking melody inspired me while writing chapter 12, one of the most visceral, emotional, gritty, and riveting scenes of the book ... IMO, anyway. Stepping back in time into Thorn's childhood, and a pivotal moment between him and the Phantom that sealed their fates and destinies forever. There you have the highlights, along with some glimpses into the book. And now, you can find all 53 songs on the official RoseBlood playlist at this link. 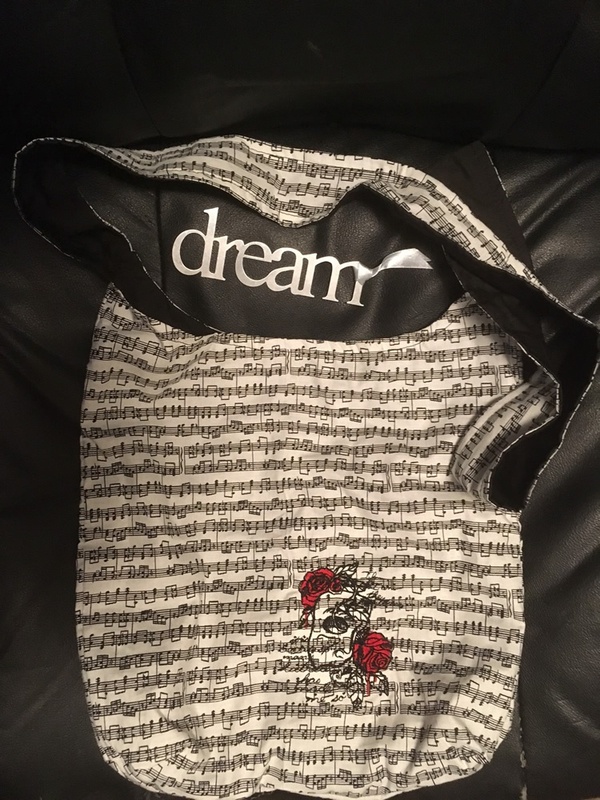 Today's INTL giveaway pack consists of these two items: Metallic "Dream" Bookmark, and a Musical Score Phantom of the Opera tote. Good luck to everyone, and be sure to join us again tomorrow for stop #3! 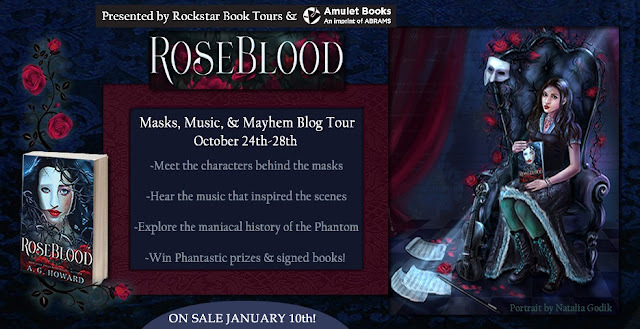 5 winners will receive a finished copy of ROSEBLOOD and a Mask, US Only. Make sure to stop by each blog below for a chance to win awesome prizes and the giveaways are International! Bookemoji- INTL Rafflecopter Stop #5: 1 - Signed & Personalized Arc + Mask Set & a Super Secret Phantom-themed Prize. Please Note: On this rafflecopter, participants have to answer a question after reading the last ½ of the chap on Pique to open the other entries. Thank you for the giveaway! I can't wait to read this book! I'm also so excited for this book! Phantom is one of my favs, and I can't wait to read this! Thanks to all the hosts for the interesting info on the book, and the generous giveaways! ahhh the music is so great!! I can't wait to read Roseblood! One of my favorite pieces to play in my concert band is Phantom of the Opera! 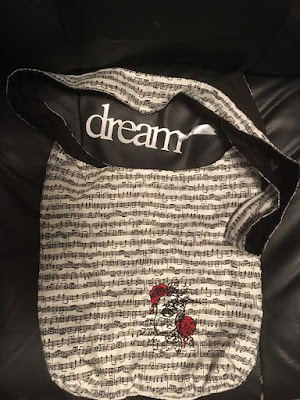 How cool would it be to carry my flute and music in this bag?!! Cool prizes. The excitement builds! Can't wait for this book and these prizes are simply amazing and I am crossing all my fingers for them! I LOVE novel playlists and for a book I can't wait to read? Just making the anticipation even stronger! So excited!!! I'm loving this thank you. Can't wait to read this book! It sounds so amazing! Love the playlist! I love the cover and the sound of the book. Want to read! 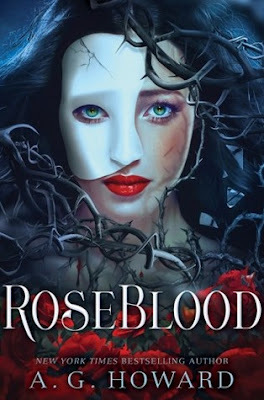 I absolutely adore this and I am elated that it is only a few more months before Roseblood will be out. So excited!!! Still keeping my fingers crossed!! So hoping to win this! Thanks for the opportunity! Great playlist!!!! Nature is an amazing song. This book looks soooo amazing! Honestly A.G. Howard gets the greatest book covers! I am really excited for this title! Thanks for the chance! Can't wait to meet new characters. This book looks so intriguing - I love Phantom of the Opera so it is definitely one I will be snapping up! Great giveaway!